There’s no better way to celebrate summer than with a party on the patio! Planning for a party can be difficult and stressful, but here are some patio party tips to ensure your summer party is one to remember. Get the invitation right the first time – A cleverly designed invitation is guaranteed to have people putting your party down on their reminder list. Make sure to be clear about the date, time, menu, attire and potential rain plans should rain make an impromptu appearance. Keep instructions short, but clear and set expectations like if the event is BYOB or if you want guests to bring a dish. Print out or purchase fun invitations to make your event more appealing and memorable. Require guests to RSVP, yes or no, by setting up an email or online event page like on Facebook. 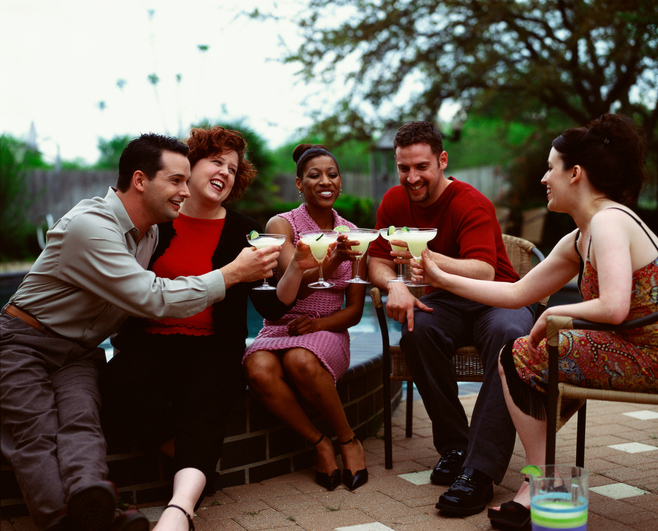 Setting the patio – A party without enough seating can sour your festivities. Even if guests don’t RSVP, you’ll undoubtedly get a few walk-ins, so make sure to have seats for as many people as you invited plus a few extras. Subtract from the guest list the number who replied no to your RSVP request to get a realistic estimate of who is coming. Instead of buying chairs, you can rent fashionable chairs from a variety of vendors for as little as $2 a piece. Get the lighting just right – Ambient lighting works best for parties, allowing guests to see at night while not detracting from the mood with too much brightness, creating a comfortable, relaxed or even dreamy atmosphere. Hang hurricane lanterns or tea lights from tree branches. Hang globe lights at various heights to play with expectations. Master the Music – You may be tempted to crank the music up, but blaring music isn’t conducive to party conversation. Keep it audible but fairly ambient, depending on the type. Top 40 is always a safe bet, but opt for breezy, relaxing summer tunes using suggestions or playlists from Spotify or Apple Music. Plan for the party running for at least four hours, so ensure the playlist doesn’t finish before then. Add more songs to pad time – if it starts over near the tail end of the party don’t fret; Bountiful margaritas and cocktails will take care of all that for you. Allied Siding and Windows can create the perfect party patio with our custom home patio design and installation services. Allied equips homeowners to meet HOA requirements by designing patios that match the character of the home and its owners. When built properly, patio covers will look like they came with the house and were not added to the home after the fact. Furthermore, many patio covers require cutting back into the roof of the home. This process is like surgery on your home – we have trained specialists with both the experience and the technical knowledge to ensure it’s done right! Our services are the most cost-effective in Texas. Contact us today to schedule a consultation and get a free estimate! We promise your patio will be a hit amongst family and friends when you show it off at your next party!